The AS8110 Series scanners are designed for Office or Point of Sale use. There are three standard interfaces, Keyboard Wedge, USB and RS-232. The unit is housed in a high-impact ABS plastic case, and can sustain a 1 meter drop to a concrete surface. The unit reads all standard linear barcodes. It will read codes with narrow bar widths of 0.005" or larger, and code widths of up to 4 inches (see Specifications). The Keyboard Wedge Model is normally used to add a barcode "front end" to existing applications. 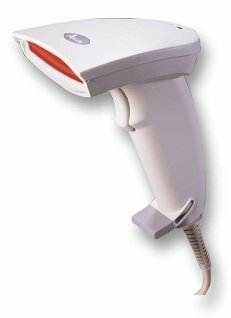 If these applications normally accept input from the keyboard, this scanner enables use of barcodes without any software modification. Data from the scanned barcodes appears as though it was entered on the keyboard. The USB Model performs identical to the Keybaord Wedge Model, except it connects through the USB port. The RS-232 Model can connect to any device that normally takes a serial data input. Baud rates up to 38,400 are user selectable, as are 7 or 8 bit word lengths and parity. The Keyboard Wedge and USB Models feature an ASCII character translation table, where the unprintable ASCII Characters can be translated into Function keys, Control and ALT sequences, and other special purpose keys on a standard keyboard. This feature can be used will full ASCII barcodes, such at Code 128 and Extended Code 39. Another special editing feature allows the insertion of up to 4 text strings within the barcode data. Resolution:        Will resolve bar widths of 0.005" or wider. Barcode Lengths:   0.007" narrow bar width - 3" width maximum. 0.010" narrow bar width - 3.75" width max. 0.013" narrow bar width - 4" width maximum. and MSI/Plessey, UK/Plessey and Telepen. or No Parity. RTS/CTS Handshaking. Connectors:        PC Keyboard Wedge can be adapted to 5 or 6-pin DIN. (will plug directly into PC Com Port).